Diabetes and depression: a vicious circle from which the patient can escape only with professional help. Both diseases are closely related - if the spirit is back on track, the laboratory parameters can improve. 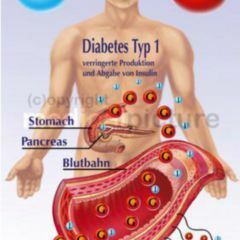 Misfortunes never come singly: Dr. Martin Teufel, University Hospital Tübingen, reports on one female patient who has suffered diabetes mellitus since the age of seven. During puberty eating disorders also arrived in the picture, in the end her weight soared to 70 kilograms. Her medical history showed both metabolic and psychiatric disorders – only taken together are diabetes specialists and therapists able to help those affected to lead a normal life again. 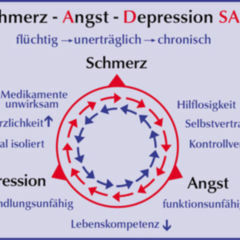 According to Professor Dr. Bernhard Kulzer, chairman of the Association for Diabetes and Psychology in the German Diabetes Society, about twelve percent of all diabetics have to deal with depression; in the general population it is about six percent. “An increase in depressive symptoms, in the same way as clinical depression, is both a physical and a mental problem”, says Kulzer. The psychologist describes aside from depression and despondency also pain, insomnia, eating disorders – according to a recently published work approximately half of all Type 2 diabetics are affected by anxiety or depression. 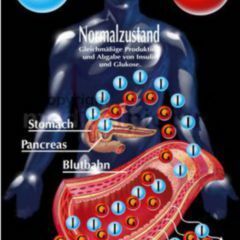 Kulzer sees the reason in particular stress factors, which also includes diagnosis and treatment of diabetes mellitus. Chronic diseases are dealt with every day and limit the quality of life severely. As well as that, work and family life can suffer, especially for patients with type 2 diabetes who have memories of a life before insulin or blood glucose meters. Especially high is the burden if late complications of the disease should already occur. At a neural level the amygdala activates the so-called stress axis, involving the hypothalamus, pituitary and adrenal cortex. A high cortisol level in turn stimulates glycogenolysis in the muscles and the liver also synthesises glucose just as diligently. Stress-induced cortisol which is secreted simultaneously promotes insulin resistance. Measuring and syringes? All the same! Patients are not only burdened directly by their mental illness. They also check blood sugar levels less often and neglect taking insulin or oral hypoglycemic agents. Studies have shown that depression is associated with a poorer control of type 2 diabetes. If compliance decreases, medical practitioners often see lousy HbA1c values. Overweight diabetics with depressive episodes also break weight reduction programs much more frequently than patients without mental health disorders. Very little will be achieved with these people with training or medication; rather, it is psychiatric help that is needed. Without the appropriate intervention, the risk of possible complications otherwise rises and patients die at a younger age. Kulzer: “In order to prevent people with diabetes having poor blood glucose control and complications, it is important to recognise both increased levels of depression as well as early depression and to treat it”. However our colleagues often overlook the comorbidities involved – one possibility would be to have the WHO-5 Questionnaire for Well-Being filled out each year. In practice, ITAS (Insulin Treatment Appraisal Scale) and the PAID questionnaire (Problem Areas in Diabetes) also give indicators on a lack of adherence to therapy. When our colleagues for a start have evidence of mental health disorders, according to Kulzer antidepressants, behavior therapy or combinations of both methods come into the picture as defined by the guideline. Diabetics can learn to accept their suffering rather than to fight it or to despair. Emotional and cognitive acceptance leads in the best cases to a significantly better metabolic situation without other changes being made to therapy. However, there are few therapists nationwide who specialise in this subject area. With psychotropic drugs it is worth taking a critical look: tricyclic antidepressants such as nortriptyline may decrease the metabolism, while with SSRIs such as fluoxetine and sertraline hypoglycemia has been observed, including necessary adjustments to insulin therapy. However, the guideline “Psychosocial Factors and Diabetes Mellitus” advises in the first place SSRIs. Positive effects of stress reduction measures such as progressive muscle relaxation according to Jacobson method or biofeedback therapy can not be proven even today without some doubt. Diabetes and depression is quickly joined by a third harmful factor: alcohol abuse. It’s true that studies have repeatedly shown that moderate consumption may protect against type 2 diabetes, especially in men. Chronic abuse, not uncommon with depression, is however a possible trigger for this metabolic disease. 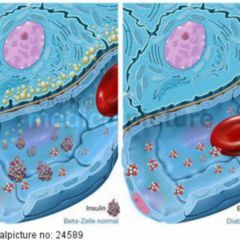 Once diabetes has manifested to begin with, ethanol leads to further damage: diabetic nephropathy occurs mainly with high-proof drinks. Ethanol also inhibits gluconeogenesis and the metabolising of free fatty acids in the liver. After excessive consumption the body quickly gets into difficulties, which involves occurance of ketoacidosis: a dreaded complication, whereby carboxylic acids accumulate in the blood and lower the pH. 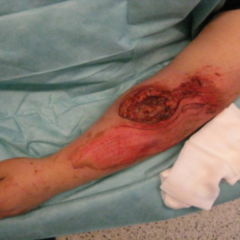 In an emergency insulin has to be administered together with fluid and electrolytes, otherwise death is a threat. All complications have yet another aspect: the question of costs. Dutch researchers recently studied health-economic aspects. In a retrospective case-control study they collected data for three years from 7,128 depressed patients and 23,772 non-depressed control subjects. Overall, they identified 393 depressed and 494 non-depressed patients with diabetes. In the former, the outpatient costs were € 1,039 per year, compared to € 492 for the latter without psychiatric comorbidity. Some months earlier, health economists from Hamburg worked on the topic. As part of a systematic literature search they found a total of 388 studies, 16 of which were analysed in full text. For diabetics with depression, the authors calculated the additional cost as 35-300 percent compared to the control group. The values can be traced back to, among other things, the additional therapies used for diabetes due to lack of compliance. Now, researchers want to address the question of whether a more effective treatment of depression in diabetic patients can reduce the cost long-term – a further argument for scrutiny among victims in search of psychiatric disorders. This is good information, this complication diabetes is overlooked the third world and poor countries. i believe this may be a contributing factor in many early death in type 2 diabeties. we need more our doctors needs more infamation on this.